For a writer and audiophile, I can also be a very visual person. When I'm working on a piece, I often cast the characters with known actors. Sometimes it's just for their voice--so in my head it reads like an audio play--but other times I have a full movie in my mind. I'll go looking for pictures that capture a character or a line.Sometimes I need pictures of settings. Sometimes my muse is aural and lives in a song or sound. Today I started working on a short story that has nothing to do with trickster gods or technomancy. There was the usual struggle with the beginning. The story fought with me a bit and for a few hours the only things we agreed upon were its setting (a hospice) and the fact that the male lead looks like a particularly nummy actor. I've already got a few pictures of him in my casting files, so I went through them, certain that I have a picture that fits this character. Today, this picture has been my muse. 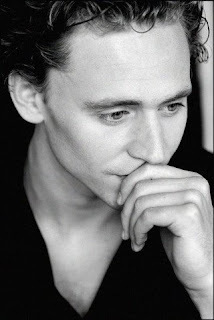 Thank you, Mr. Hiddleston, for being so right for this role. Older PostThings That Make You Go, "WTF?!"